With Back to School season upon us, it's all about shopping the right products to get our children into the best school starts. 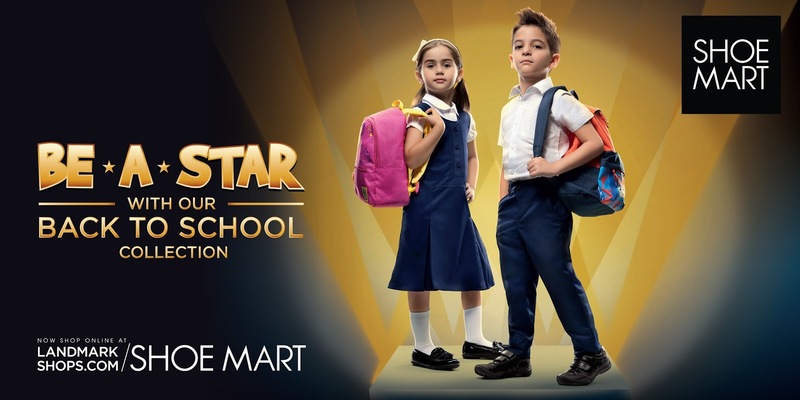 Shoe Mart the region’s leading footwear and accessories, tell us about it's new collection: a delightful array of smart and comfortable styles that will go perfectly with school wear. Girls will get to rock the classy school-goer look featuring floral accents, perforations, glaze-matt contrasts and embossed effects. Sturdy year-round materials bond with flexible soles to assure relaxed wear day in and day out. The boys will be spoiled for choice with an impressive range that’s durable enough to sail through the action-packed year. High on comfort and style, the specially designed range features all leather Velcro strap ultra-light shoes. White canvas sneakers take care of sporty days and are designed to withstand boys’ active lifestyles. The ‘Back To School’ Collection at Shoe Mart caters to kids of all ages including tweens and teens. Formals and casuals for varying age groups are just the perfect start to the new academic year. Several designs by brands like Skechers, Lee Cooper, Kangaroos and Dash provide an eclectic range from sharp to sturdy to fashion-forward. The Back To School collection is available across Shoe Mart stores in the region. 1/ follow Dubai our Sandbox and Shoe Mart on Facebook. The winner will be announced on Thursday August 27th via Facebook.